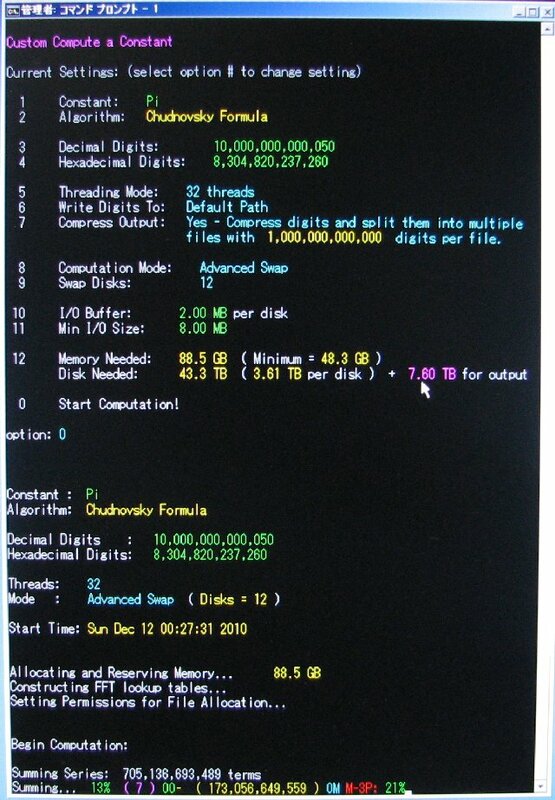 December 28, 2013: The record has been improved to 12 trillion digits. For anyone who is interested, this was recently the topic of a Stack Overflow question that I answered. 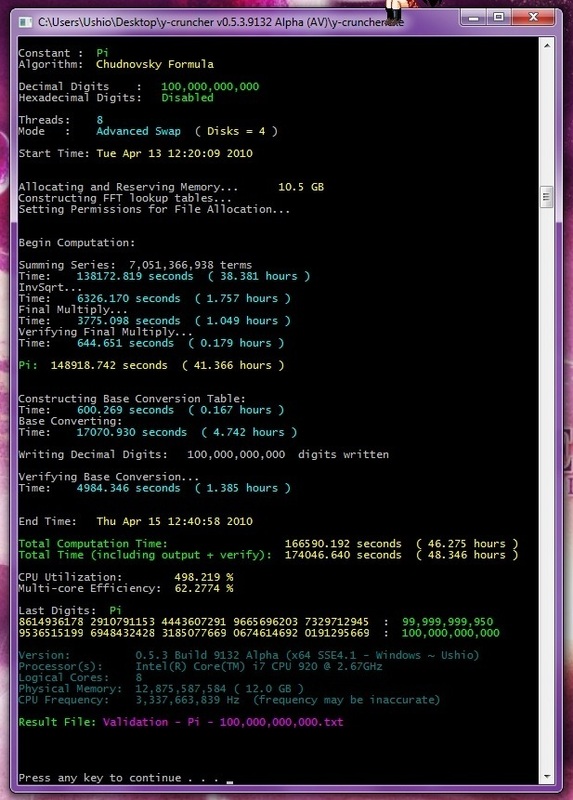 Computation Statistics - All times are Japan Standard Time (JST). 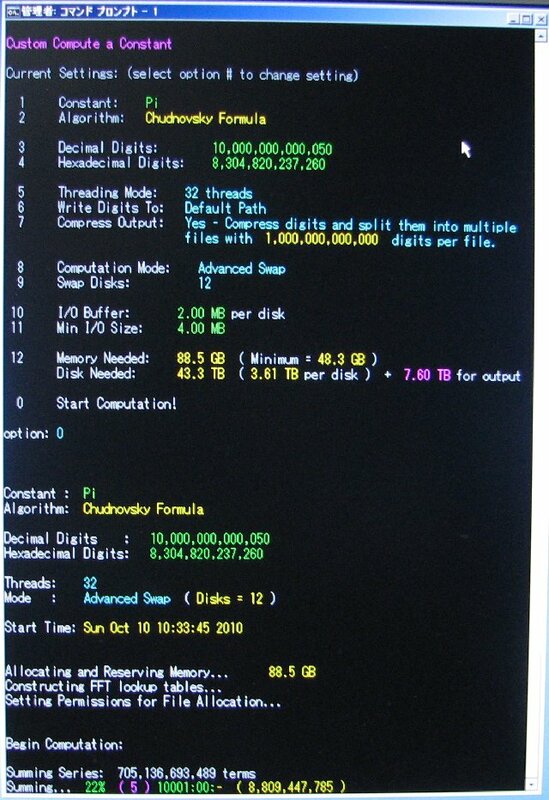 Just like last time, the full computation statistics are listed below. Likewise, the final screenshot is shown. However, due to the numerous times that the computation had been interrupted, the screenshot only shows the final leg of the computation as opposed to start -> finish. 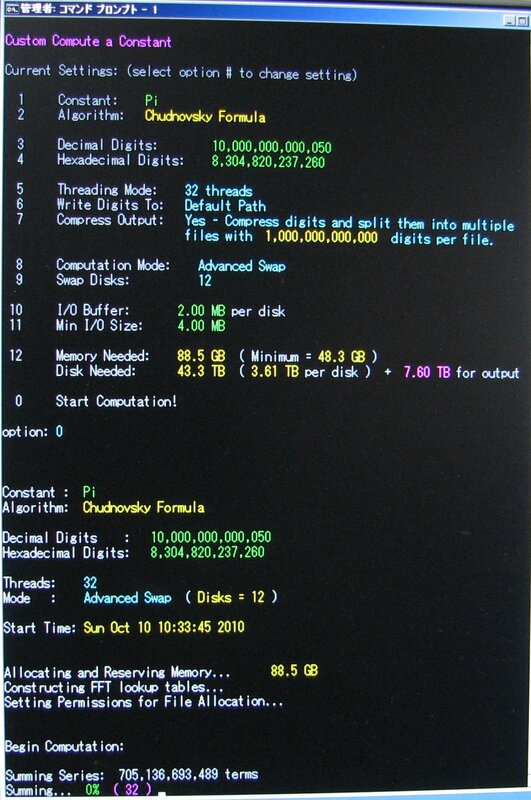 The main computation took 371 days on Shigeru Kondo's desktop. The computer was dedicated for this task. Over the course of the computation, there were multiple hard drive failures. Each of which required us to roll the computation back to a previous checkpoint. The result was approximately 180 days of lost time. 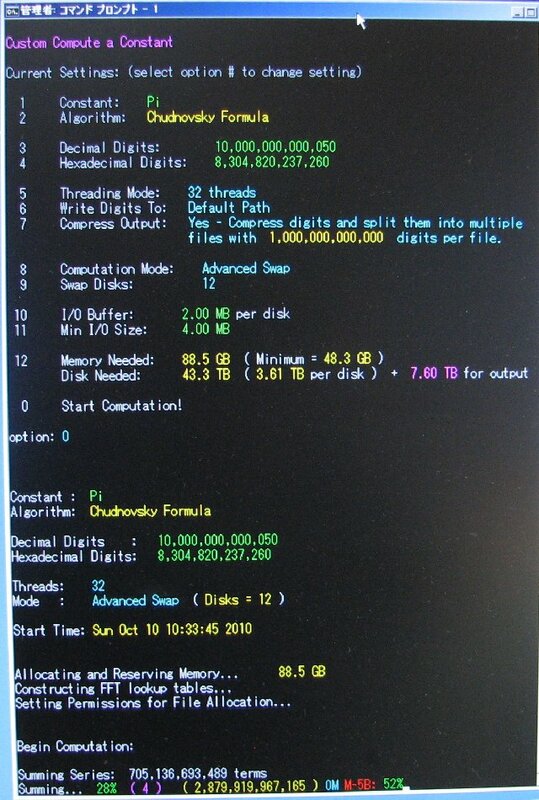 Roughly 44 TB* of disk was needed to perform the computation. 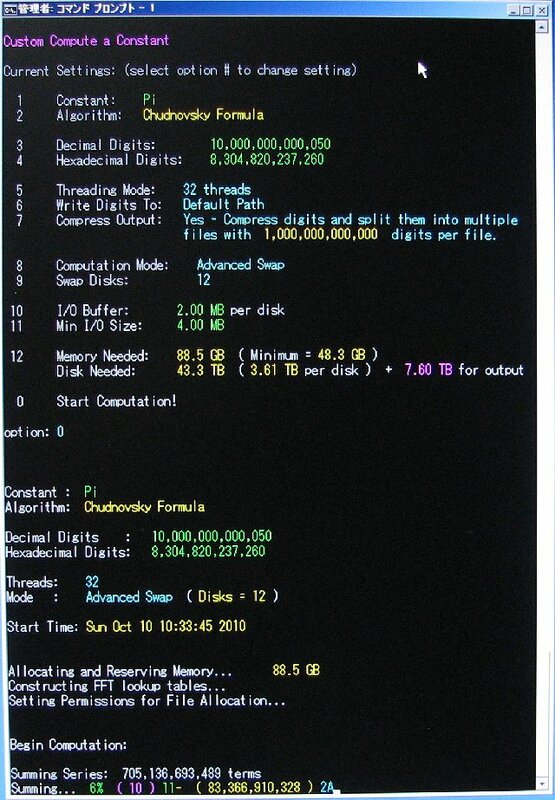 Another 7.6 TB of disk was needed to store the compressed output of decimal and hexadecimal digits. If the digits were stored in an uncompressed ascii text file, the combined size of the decimal and hexadecimal digits would be 16.6 TB. 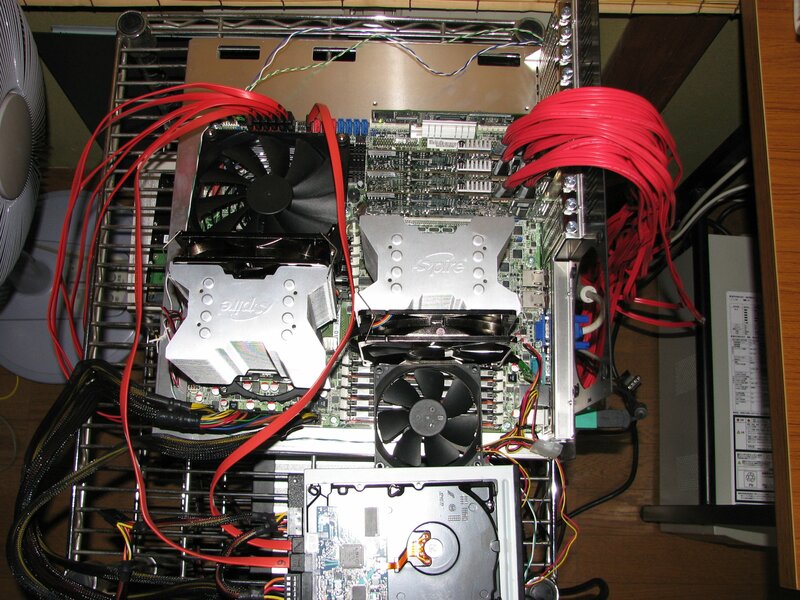 Note that the multicore efficiency % is inaccurate due to the numerous times that the computation has been interrupted. For a detailed timeline of events related to this computation, see here. 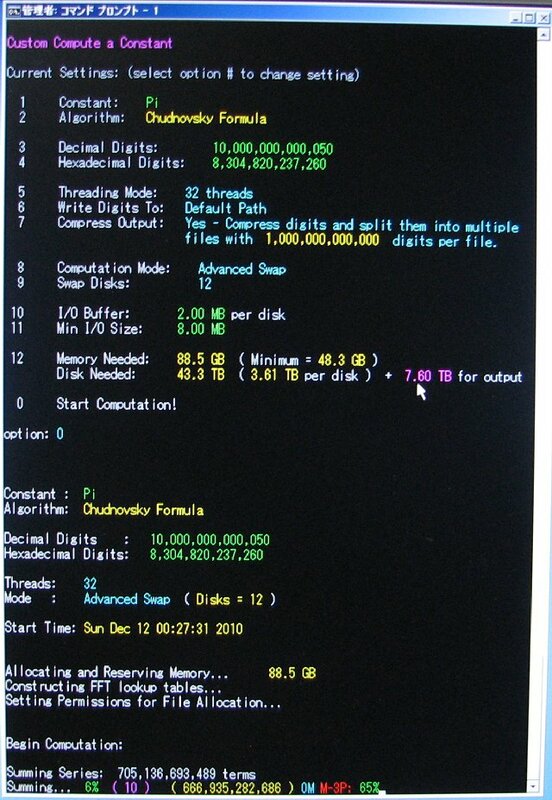 This computation was basically a followup to our computation to 5 trillion digits. So the motivation and purpose is the same. 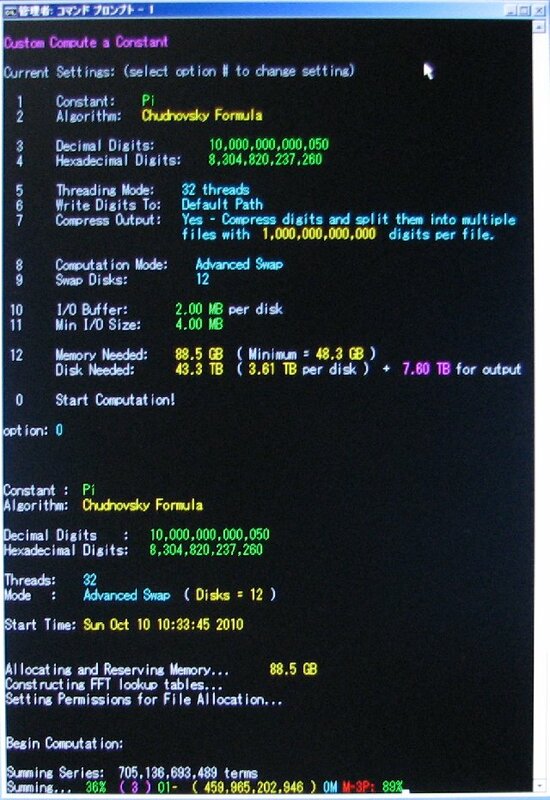 As we will show, reaching 10 trillion digits of Pi is much more difficult than 5 trillion digits using our current methods and 2010 computer hardware. The machine we used is mostly the same as the previous computation. 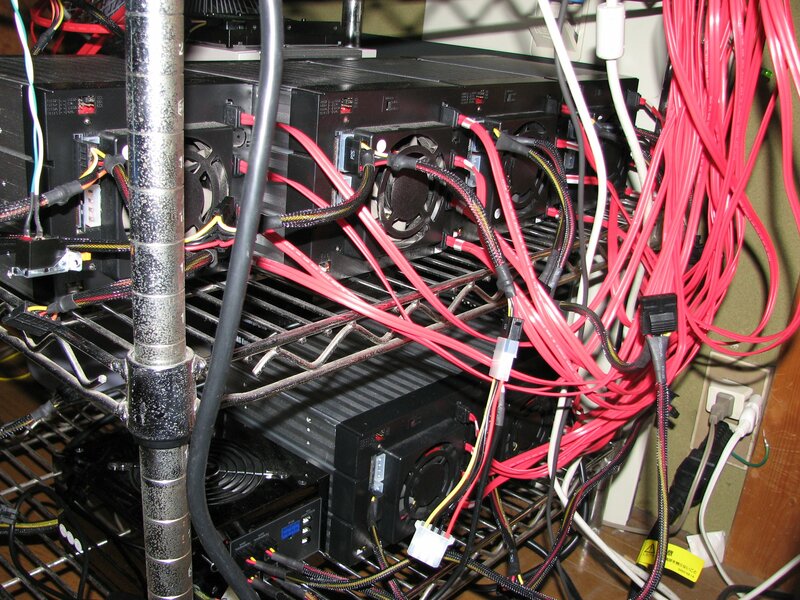 The only main difference is that there are more hard drives. As with the hardware, the software side hasn't had any changes since our previous computation. 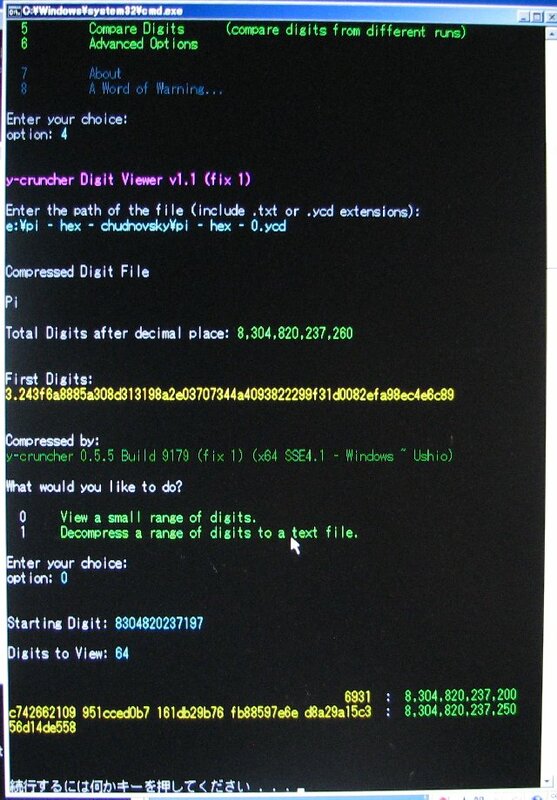 The program that was used for the main computation is y-cruncher v0.5.5. 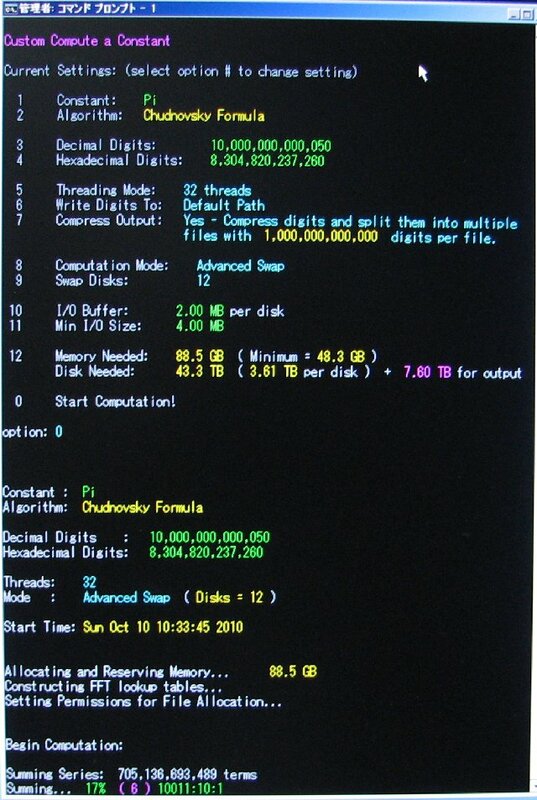 Multiple builds were used between the different times that the computation was interrupted. Version v0.5.5 is virtually identical to v0.5.4 as it consists only of a few bug fixes and adds a few improvements that are irrelevant to this computation. 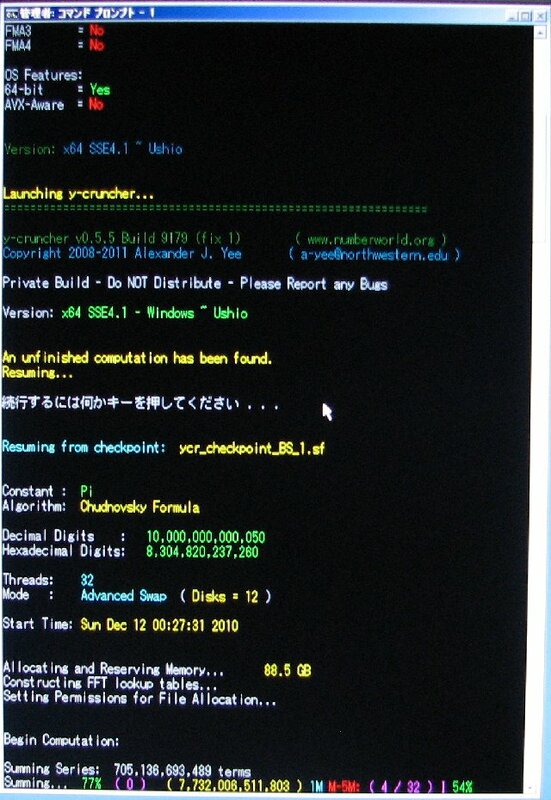 The program that was used for the verification is y-cruncher BBP v1.0.119. 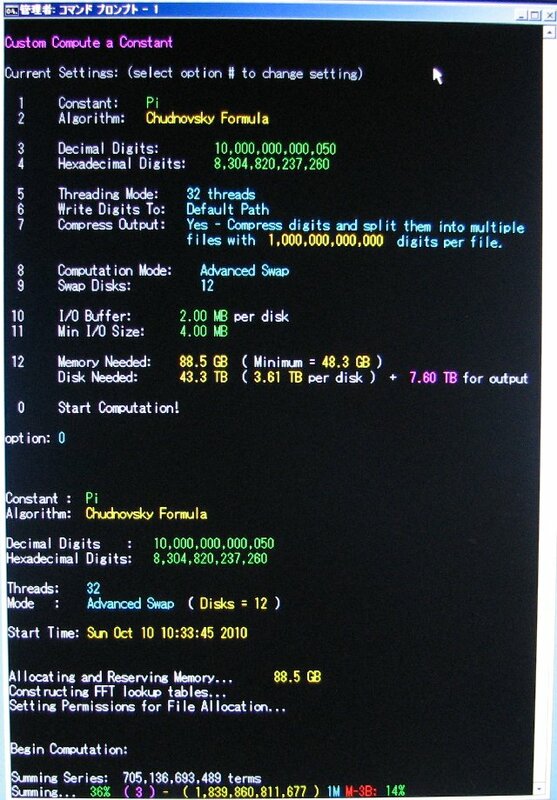 This is the exact same binary that we used to verify our previous computation. There have been no changes at all. 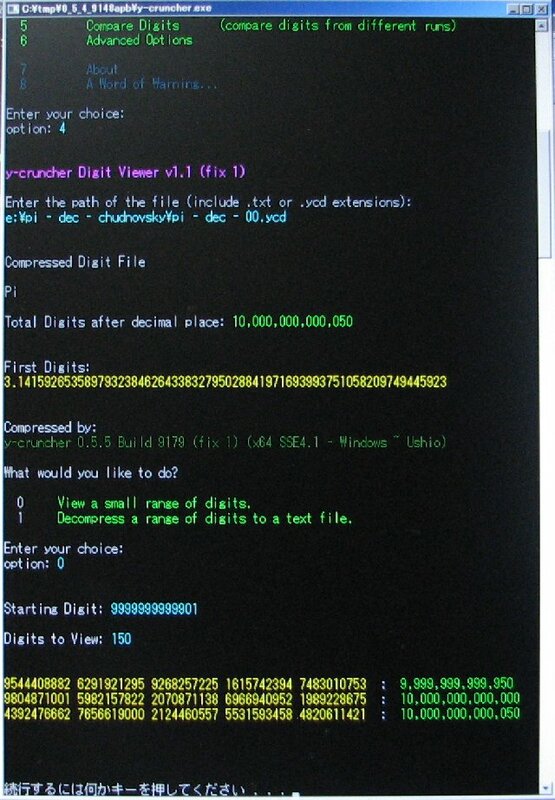 This program implements the digit-extraction algorithm for Pi using the BBP formulas. It's sole purpose was to verify the main computation. Both programs are written by me (Alexander J. Yee) and are available for download from their respective pages. Nothing has really changed from last time. See here for details. Week 1: Series summation is past 6% complete. Week 2: Series summation is past 13% complete. Week 3: Series summation is past 17% complete. Week 4: Series summation is past 22% complete. Week 5: Series summation is past 28% complete. Week 6: Series summation is still past 28% complete. Week 7: Series summation is past 36% complete. Week 8: Series summation is still past 36% complete. A backup was scheduled for when the 36% - 47% block was completed. Checkpoint 4: Manual backup at 36%. Hard Drive Read Error: Roll back to Checkpoint 4. Hard Drive Write Error: Roll back to Checkpoint 4. All hard drives of the same model as the failed drive are replaced. Week 9: Series summation is past 36% complete. Week 10: Series summation is still past 36% complete. Week 11: Series summation is still past 36% complete. Checkpoint 3 Reached: Manual backup at 47%. Week 12: Series summation is past 47% complete. telling me that's he's okay. Week 13: Series summation is still past 47% complete. by the earthquake. The western grid (60 Hz) was not affected. Week 14: Series summation is past 47% complete. Week 15: Series summation is still past 47% complete. Hard Drive Write Error: Roll back to Checkpoint 3. Week 16: Series summation is past 47% complete. Week 18: Series summation is past 47% complete. Week 19: Series summation is still past 47% complete. Week 20: Series summation is still past 47% complete. Hard Drive Read Error: Unrecoverable this time, roll back to Checkpoint 3. Week 22: Series summation is past 47% complete. Week 23: Series summation is still past 47% complete. Checkpoint 2 Reached: Manual backup at 60%. Week 24: Series summation is past 60% complete. Week 25: Series summation is still past 60% complete. Week 26: Series summation is still past 60% complete. Week 27: Series summation is still past 60% complete. Checkpoint 1 Reached: Manual backup at 77%. Week 28: Series summation is 77% complete. Week 29: Series summation is past 77% complete. Week 30: Series summation is still past 77% complete. Week 31: Series summation is still past 77% complete. Week 32: Series summation is still past 77% complete. Week 33: Series summation is still past 77% complete. Checkpoint 0 Reached: Manual backup at end of Series Summation. Week 34: Final Division step of Series Summation. Week 35: Final Multiplication step of Series Summation. Week 36: Iterating Square Root. 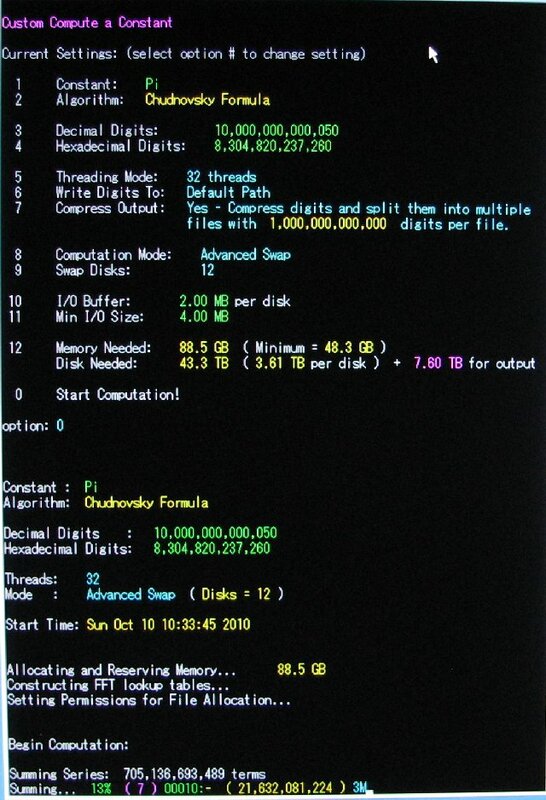 Computation of Pi Complete: Output 8.3 trillion hexadecimal digits of Pi. The digits match the BBP results!!! Hard Drive Read Error: Roll back to end of series computation. 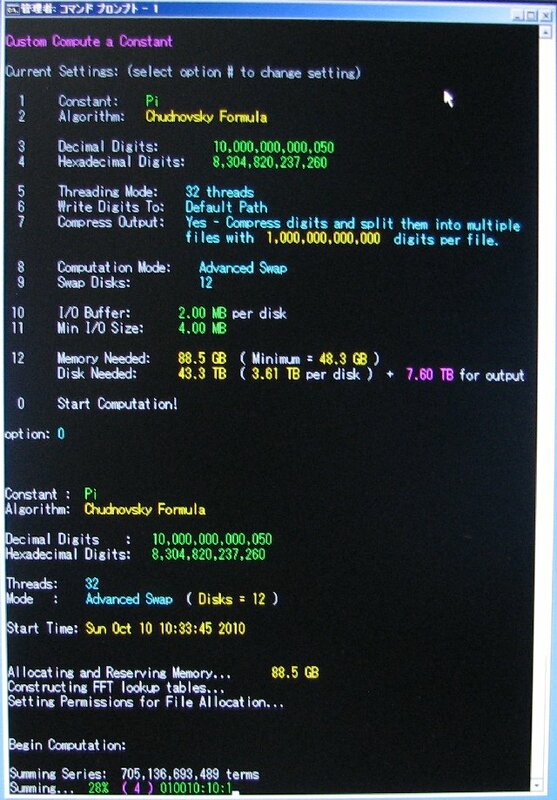 Pi Computation Checkpoint: Manual backup at end of Pi computation. 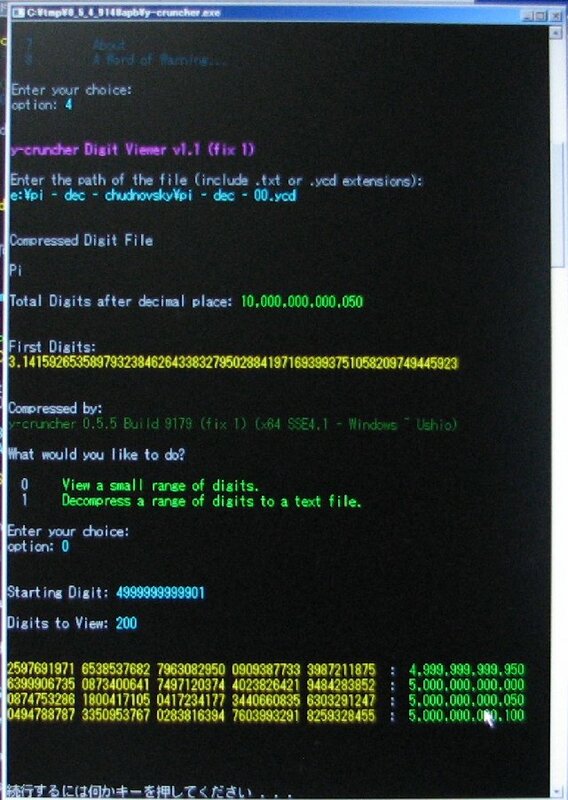 Base Conversion Complete: Output 10 trillion decimal digits of Pi. The digits match our previous 5 trillion digit computation. 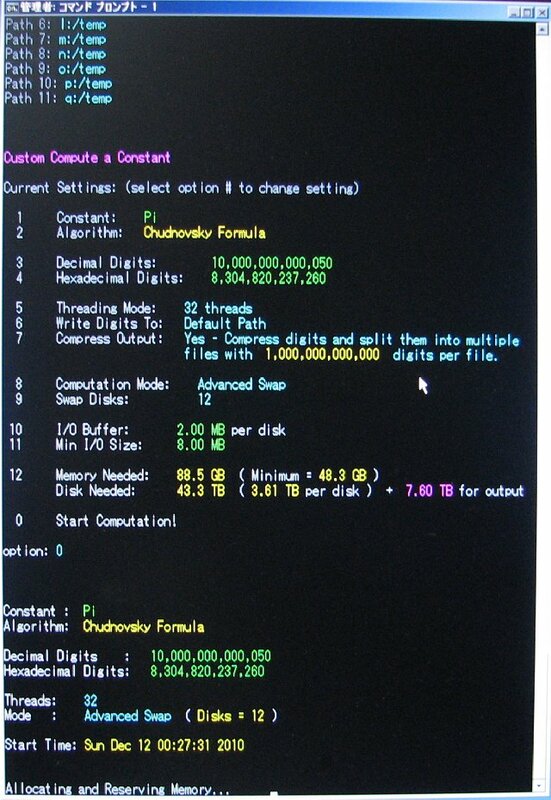 Verification Complete: End Computation of 10 trillion digits of Pi!! !